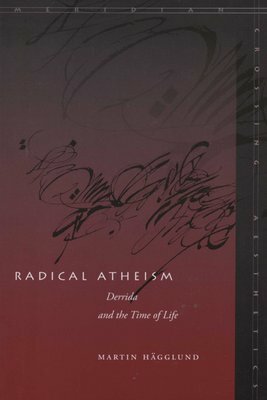 "Radical Atheism" presents a profound new reading of the influential French philosopher Jacques Derrida. Against the prevalent notion that there was an ethical or religious "turn" in Derrida's thinking, Hagglund argues that a radical atheism informs Derrida's work from beginning to end. Proceeding from Derrida's insight into the constitution of time, Hagglund demonstrates how Derrida rethinks the condition of identity, ethics, religion, and political emancipation in accordance with the logic of radical atheism. 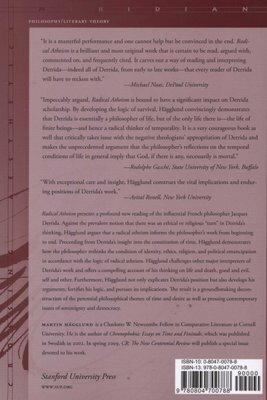 Hagglund challenges other major interpreters of Derrida's work and offers a compelling account of Derrida's thinking on life and death, good and evil, self and other. Furthermore, Hagglund does not only explicate Derrida's position but also develops his arguments, fortifies his logic, and pursues its implications. The result is a groundbreaking deconstruction of the perennial philosophical themes of time and desire as well as pressing contemporary issues of sovereignty and democracy.